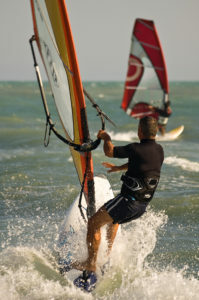 If your looking for information on windsurfing Cape Cod, we’ve got it. You will find these pages packed with up to the minute info as well as links to other sources, such as the best places to rent equipment, the best places for lessons, and the best beaches to sail from. The popularity of Cape Cod windsurfing continues to grow, and it is no wonder. Cape Cod boasts some of the most reliably sailable winds in New England. Consistent southwesterly breezes along the Cape’s Nantucket Sound shoreline make this a premier destination for New England windsurfers. Windsurfing has been around for 30 years or so, and in that time, technology has made the sport easier and easier to master, with the advent of more stable boards and lighter, more maneuverable sails. When I first attempted windsurfing some 25 years ago, I became frustrated and lost interest because of the difficulty involved in the sport, with the older equipment. Today’s equipment is a different story, with a few lessons and the right board and sail for you, you will be able to enjoy a lifetime of sailing fun! For those of you who are more adventurous (crazy!!! ), kiteboarding may be your thing. When it comes to windsurfing Cape Cod, Old Silver is one of the more popular beaches. Free of currents, these warm waters, and consistent southwesterly breezes are an ideal spot for windsurfing and fun in the sun. Directions: Take Route 28, follow signs to Quaker Rd. Kalmus is a premier destination for windsurfers across New England. Its consistent southwesterly breezes make for some of the most reliably sailable winds on the east coast. Stretching for more than a mile along Nantucket Sound, this is the most popular beach in the Mid-Cape area, and rightfully so. West Dennis has everything that you could want in a beach. Its huge parking lot can accommodate over 1000 cars, so parking is seldom a problem here. Directions: Take Lower County Rd. to Lighthouse Inn Rd. These are just a few of the many great beaches for windsurfing Cape Cod. If you have others that you would like to add, simply comment below! Thanks, and may the wind be always at your back! Votes From Our Readers for the Best Cape Cod Windsurfing Beaches! Alex – Colorado – Megansett Beach on Buzzards Bay has great conditions with SW winds. There is a public beach and one can launch from nearby private beach. It is relatively shallow close to the beach and slightly protected from the wind. The wind picks up farther out and one can go out on Buzzards proper for more. Wolly – NH – Pleasant Bay, off Rte 28 north of chatham. Watch for a steep dirt road that dives down to the bay where there is plenty of free parking, but no toilets! Shingle/sand beach. Great flatwater sailing in north and north westerly stiff breezes, where you can get good runs across the bay. Sailable even at low tide Particularly good for cruising a longboard on light wind days, exploring the shores and islands of the bay. John – MA – Kalmus Beach! Tell us about your windsurfing Cape Cod favorites in the comments section below!